The needs are ever-changing. In my case I have downsized from big dSLR Leica R cameras in 2009 to Leica M. Ideally I travel with just a Leica M with a 50mm over the shoulder and a spare battery and a spare memory card in the pocket. 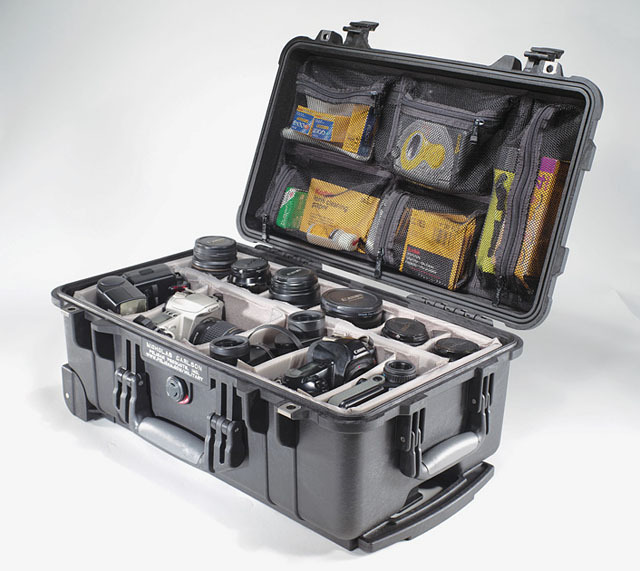 With the Leica M9, Leica M Monochrom and Leica M Type 240, plus backup cameras, the going from place to place can require a bit more bags than I like. In general everything camera and computer-related goes with me and does not get checked in. The exception is reflectors, tripods and extra battery chargers. If cases are delayed I have a spare battery charger with me, as well as the Apple Travel Kit plugs I may need to stay powered up. So even some of the gear has a value and/or shape that make you think it shuld go in the checked in luggage, take a moment and think how you will work if the bags are delayed or lost. 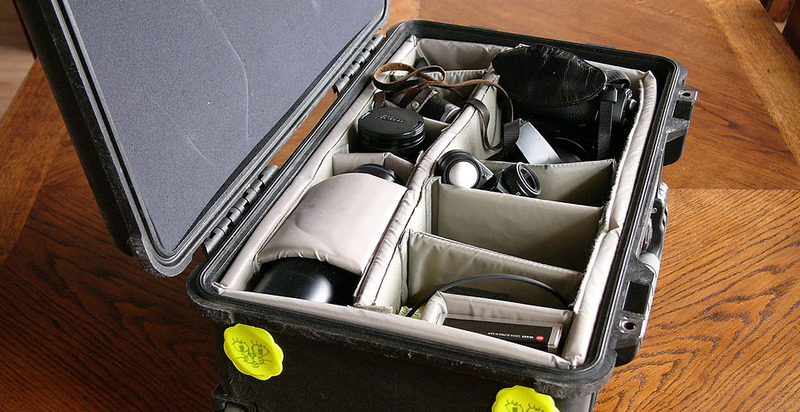 Then pack your carry-on so you can perform your work no matter what. I never actually lost any luggage, only had delays. I will pack extra iPads and such in my suitcase, I'm not afraid of loosing it really. But I do think in the handling of luggage and delays, and that is my main concern in what goes where. When in route back from Africa in 2009 I had the fortune of passing through Charles de Gaulle Airport in Paris. As the plane was delayed, we had to run through the airport with all our shoulderbags to arrive at the right gate where there was a tremendous line of people waiting for their security check. This fine piece of architecture is distinguished by having a long "hallways" which goes on for kilometers, and with the gates on the side. Problem is that when there's a line waiting for security at each gate, the "hallway" is not wide enough. And at the same time there's stairs and all so you can't use a luggage wagon. So you drag your stuff over the shoulders as you run through this endless airport that is utterly jammed with people waiting in lines. So what I remembered after this was not the stellar architecture but the pain in my shoulders from carrying my bags through this endless airport. Which is why I decided to get wheels on my photo bags. 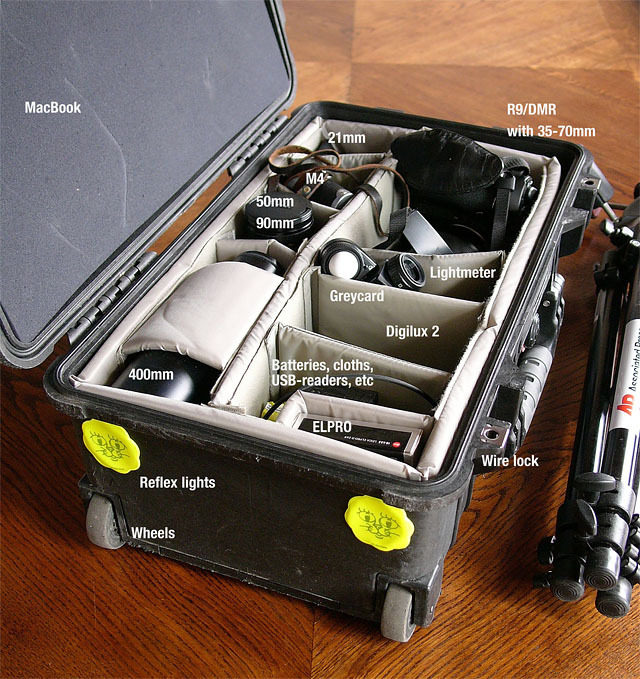 The solution was the Peli 1510 as I realized that mostly I will be having my gear in my office, in my car, or - when abroad - transport it with busses, trains, airplanes and eventual arrive where it will be stored in a hotel room or in the back of a car. It's extremely rare that I "get out in the bush" without a car. The result being that mostly we park, I grab a camera or two and walk the last meters. Shoot, then go back to the car. 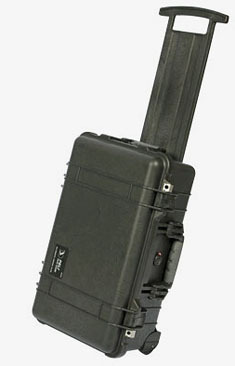 For this purpose the Peli 1510 is perfect protection. Only in the London Subway and on few other occassions I have to carry it. Most of the time it rolls- or lies in a car. You can get it with foam but I prefer the soft dividers as I often change what's in the bag. Here you can get an impression of what can be fitted into it. In the beginning I missed my soft bags where you can always find a small pocket for something. But with a little training you can fit big and small items into this as well. You can buy an extra set of dividers as the whole divider-thing can be lifted out of the bag just like that. So you could have different sets for different purposes. Though for me, that's not necessary. It's easy to change the dividers position. I mostly have R gear in mine, but as can be seen, a Leica M fit in perfect in the upright position. But for a pure Leica M setup it's probably a bit too big. Digilux 2 for with face down (I used the D2 to take this photo so you'll have to imagine it being there with the screen pointing up). Note that I have put reflexes onto it so that when rolling on a dark road (outside rock festivals for example) I can be seen from behind. But else I prefer bags and cases to be invisible (black) and not to look like they contain expensive stuff worth stealing. I also have a wire lock which is a long cable with a lock on it. And I have a normal lock as well. Both of them is code locks so I don't have to worry about where the key went. The wire lock can also be used to attach the iMac to a table or something when working on location. 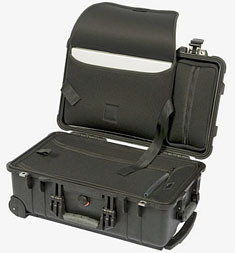 Here's a studio photo of a Peli 1510 with Canon gear and - interstingly enough - pockets in the top. My experience is that the foam is good to keep small parts in place. And I prefer that nothing moves around inside the bag as there's so much lens glass in it (never put a heavy metal lock inside the bag as it will move around like a hammer). If you look at this photo you will also see that the lenses will cause a problem at some point when the bag is closed. I will get back later with other bags and storage experiences. Thorsten Overgaard is a Danish feature writer and photographer. 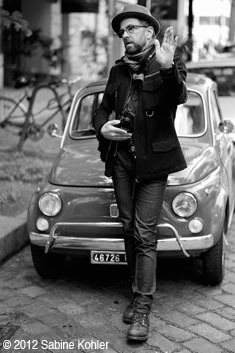 He currently photographs for WireImage, Getty Images, Polfoto and Associated Press. Wheels is what it is all about. I have a system where I attach my monopod and reflector to the top handle and have them resting on the bag so that all parts are on wheels and in one hand. I don't have this but it looks handy for the laptop. I've made a cut-out in the foam for my MacBook instead.